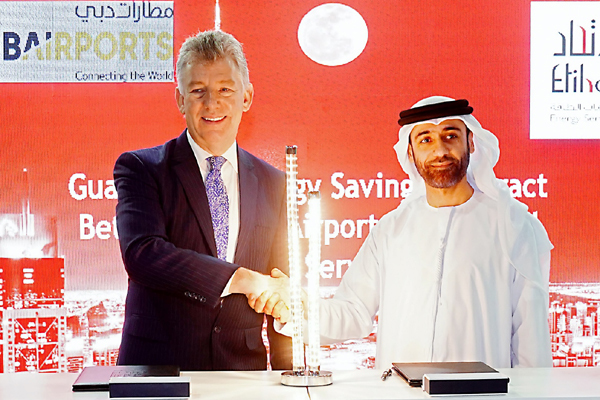 Dubai Airports and Etihad Energy Services Company (Etihad ESCO) have announced a joint project to replace 150,000 conventional lamps at Dubai International Airport (DXB), including all high-mast floodlights on the apron and streetlights, with energy efficient LED bulbs. When combined with plans to erect a photovoltaic (PV) array on the rooftop of Terminal 2, Dubai Airports and Etihad ESCO estimate a 5 per cent reduction of energy consumption at the world’s busiest international airport - equivalent to offsetting C02 emissions by an estimated 22,000 tonnes per year. The announcement follows the signing of an agreement between the two entities at Wetex 2018 exhibition which opened in Dubai on Tuesday. The project also involves the installation of a 4,989KWp rooftop solar energy system at DXB’s Terminal 2 – the largest photovoltaic installation at an airport in the Middle East. Comprising approximately 15,118 photovoltaic panels, the massive solar installation will generate up to 7,400 MWh annually. Works on the project will begin in the coming weeks and the installation is expected to be complete by the second half of 2019. “Dubai Airports’ partnership with Etihad ESCO reflects our commitment to achieving environmental sustainability. We support Dubai’s Integrated Energy Strategy 2030 which aims for a 30 per cent reduction in Dubai’s energy consumption by 2030. We believe that these initiatives will help us reduce our carbon footprint significantly and contribute to our efforts towards a carbon-neutral future in line with the aviation industry’s target,” said Paul Griffiths, CEO of Dubai Airports. The new project is an extension of an existing partnership between Dubai Airport and Etihad ESCO which goes back to October 2017 when the two entities signed an agreement for the retrofitting of DXB’s Terminals 1, 2 and 3 enhance the facilities’ energy efficiency and reduce its water and electricity consumption by 20 per cent. Dubai Airports has implemented several green initiatives over the years including recycling of waste, use of energy efficient fittings, optimisation of cooling systems, as well as installation of solar energy systems at DXB’s Concourse D (1,060 MWh) and at Dubai World Central (260 MWh). Through these efforts, Dubai Airports achieved energy savings of 4.58 Million kWh in 2017 across DXB and DWC.